Last week, my sister’s boyfriend and his friends competed to finish a ‘hellfire burger’ filled with ghost peppers to win a free t-shirt. A burger eating competition may not seem like that big of a deal, but anything that can break a grown man into tears is something to be examined. Although chili peppers first appeared around 7,000 BC in Mexico, Christopher Columbus did not technically discover them until around 1493. After trying to look for an alternate black pepper, Columbus found a ‘small hot pod’ instead. Since then chili peppers have spread across the world and gained fame for their heat. The ability for chili peppers to cause a blazing sensation comes from capsaicin. Capsaicin is an insoluble in water, tasteless, odorless compound that gives chili peppers that extra ‘kick.’ The Scoville scale measures the capsaicin content. Pure capsaicin is 15,000,000 Scoville heat units (SHU); jalapeno peppers range from 2,000-8,000 SHU; mild bell peppers are 0 SHU. The Bhut Jolokia, commonly called the ‘ghost pepper,’ originated in India and held the title of being the hottest pepper in 2007. Since February of 2011, this record has been overthrown three times. The ghost pepper is 855,000 to 1,041,427 SHU. You must wear gloves to pick up the Bhut Jolokia, if allowed, it will eat through car paint, and yet it is currently only the 4th hottest chili pepper. In February 2011, the Infinity Chili pepper was hailed the hottest pepper at 1,067,286 SHU. Sadly, for chili breeder Nick Woods of Lincolnshire, England was this victory was short-lived. Two weeks later on February 25th of this year, the Naga Viper pepper registered at 1,382,118 SHU, scorching the competition. This unique hybrid is a mix of the Naga Morich, the Bhut Jolokia, and the Trinidad Scorpion peppers, created by Gerald Fowler, another Englishmen. Due to the nature of hybrids, and the instability of offspring traits there is yet another hottest pepper. 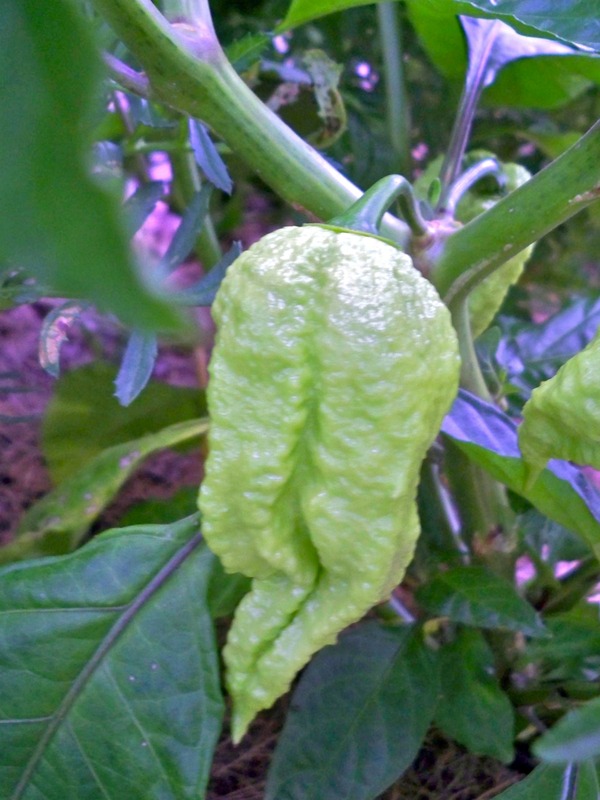 Since March there has been a new reigning hottest pepper called the Trinidad Scorpion Butch T pepper. Not to be confused with other Trinidad Scorpion peppers, this pepper is a particular strain created by Butch Taylor and measuring at 1,463,700 SHU. However, like other ‘scorpion’ peppers it has the same pointed end resembling a scorpion’s stinger. To touch this pepper you must always wear protective gloves. Also, exposure to the eye or skin near the eyes can cause temporary blindness. A chemical mask or body suit must be used to block off fumes in the cooking process. To most, this obsession with creating a pepper so hot it could cause blindness may seem absurd. To others this mania is a searing passion. As Christian Flickinger, of the Garden Hoard, said, “I love spicy foods…and when I found out there were peppers that were so hot they were hard to eat, I had to grow them.” Only chili peppers contain the capsaicin needed to give that extra piquancy. Besides making peppers sweltering, capsaicin offers health benefits. It is effective treatment for inflammation, reduces risk of heart attacks, clears blocked nose and congested lungs, and prevents stomach ulcers by killing bacteria. All peppers are good sources of Vitamin A and Vitamin C that work to lower blood pressure. You can pick up these peppers at local farmer’s markets. To find out which ones in particular check out on Real Time Farms and look for vendors with pictures featuring these unique hot creations. After buying these peppers just remember that water is of no use to quenching the burning heat a chili pepper provides. Capsaicin is insoluble in water after all. On the other hand, consumption of dairy products (the more fat the better) is the best suggestion. Keep in mind that avoiding seeds will not prevent the heat. Capsaicin is in the placenta of the pepper that attaches the seeds to the pod. For those of you that like it hot, the smaller and thinner the pepper, the hotter it is! This entry was posted in Food Warrior Interns, In the Kitchen (recipes & more) and tagged capsaicin, chili peppers, food warrior interns, ghost peppers, hot peppers, peppers, Real Time Farms, Susie Zammit. Bookmark the permalink.